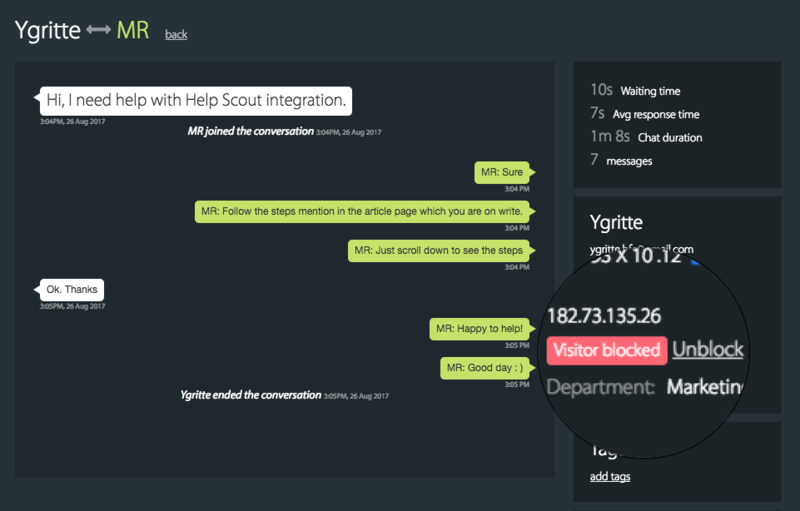 Visitor Blocking feature allows you to block abusive visitors and spammers from chatting with support agents. Visitors can be blocked using their IP address, email or phone number. This feature is available on all the paid plans. Only Admin(s) can enable this feature. Both Agent(s) and Admin(s) can block visitors. 2. Go to Manage > Visitor Blocking. 3. Turn on Enable Visitor Blocking option and click Save. 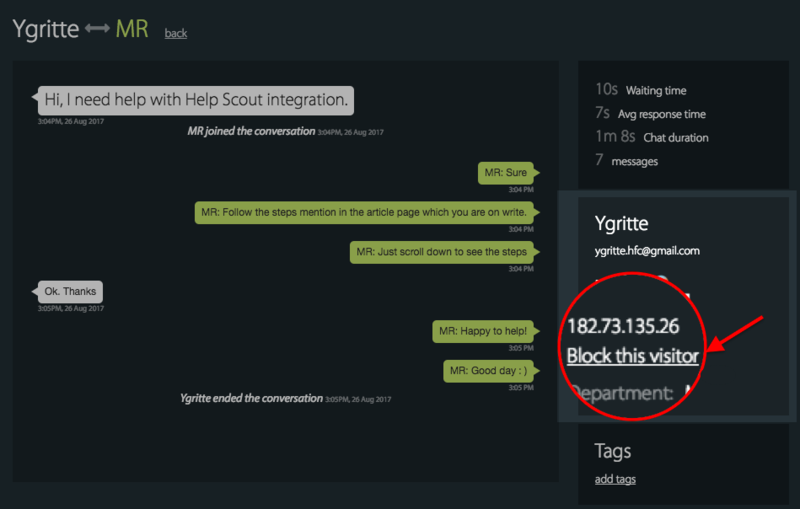 Simply use the command "!blockVisitor" in the chat area and hit enter. The system will prompt you with a confirmation dialogue box. On selecting "Yes", the chat will be ended on the agent side. And the widget will hide/disappear at the visitor end. By default, the visitor will be blocked for 3 days. Admin can change the number of days under Manage --> Visitor blocking. You will find "Block Visitor" option on the right side of the chat transcript as show in the panel below. Blocked visitor's transcript under History. To unblock, just hit "Unblock" option right next to the 'Visitor blocked" label. Go to Visitor blocking under Manage section --> Click "Block visitor" to add the details of the visitor to be blocked. 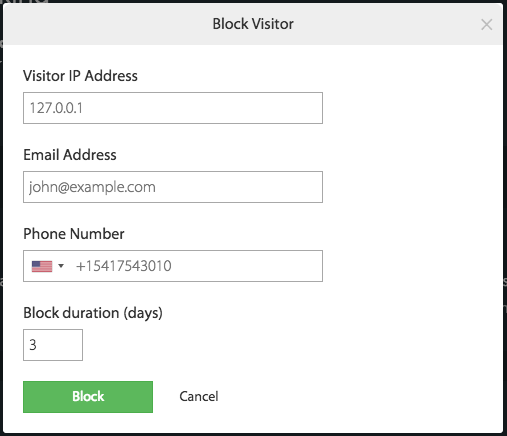 Block visitor using their IP address, email address or phone number. Any one detail is mandatory. Choose for how many days do you want to block the customer. All the blocked visitor details will be shown under Manage --> Visitor Blocking. If the visitor is blocked during an ongoing chat, the admin can view the chat transcript to understand why were they blocked by clicking the 'View chat history' link provided across the blocked visitor entries. Clicking the link will take you to the respective chat transcript.